A party of 7 gathered at Crowden car park and under threatening clouds unanimously decided it was waterproofs on from the outset. We followed the Pennine Way through the lower reaches of Crowden Great Brook before leaving the valley to climb steeply towards Laddow Rocks. The streams were swollen after much recent rain, but this did not deter one member from indulging in a spell of wild water swimming. He quickly regained drier ground. Once on the edge path we were greeted by a fresh wind and sleet, but the visibility was good and afforded views of the valley ahead and Black Hill under low cloud. We found shelter for a brief refreshment stop and before long we joined the paved path which led us easily to the summit of Black Hill (582m). 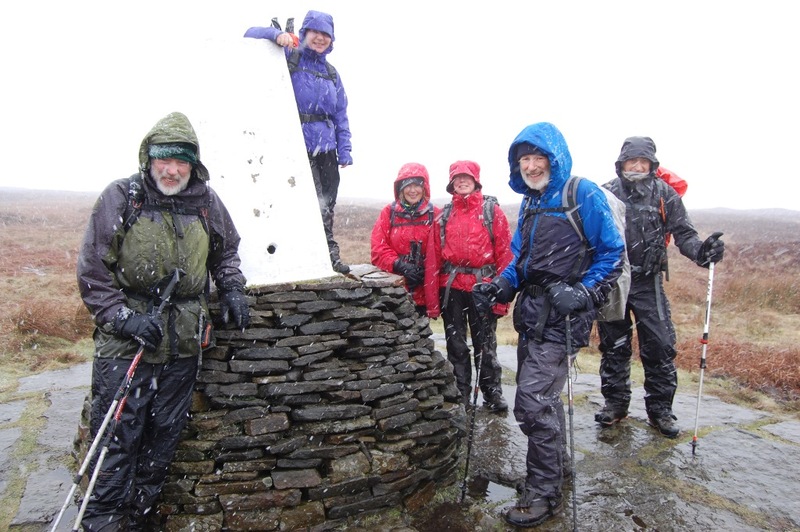 We paused briefly for a summit photograph then headed south over Tooleyshaw Moss following the indistinct path, as the snow began to fall heavily. As we emerged from the gloom, we glimpsed Torside Reservoir in the distance, and we continued our descent to join the path down Crowden Little Brook which brought us to our starting point. A good walk of just over 9 miles, with plenty of fresh air, and a reminder that winter is still with us.